Before last weekend I knew nothing lebkuchen. I had never heard of it nor knew such a thing existed. Even taking 3 years of German in high school and a trip to Berlin few years ago didn’t help. Of course all it took, in the end, were tweets from Shuna Lydon and Sarah Simmons and on Sunday I found myself walking home with a box of lebkuchen. So what’s lebkucken? 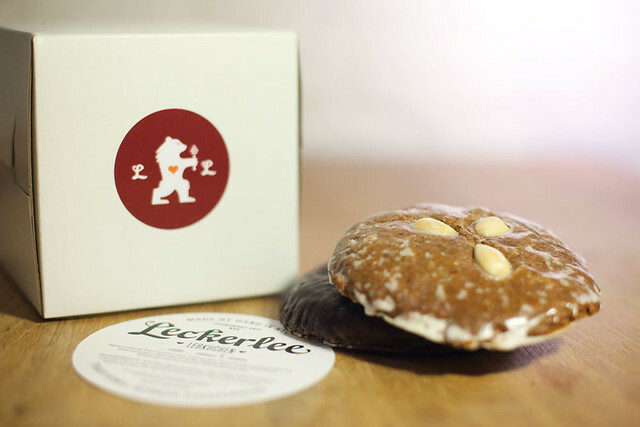 According to Sandy Lee, the master mind behind Leckerlee, lebkuchen is a traditional German gingerbread cookie that has been around for centuries. Apparently they’re crazy about these over in Germany. Of course the important thing is…how the heck did they taste?! Orange zest! I never really had gingerbread before so I couldn’t compare but Leckerlee’s lebkuchen is quite delicious. The inside is almost cake like filled with spices and other things that make the cookies crazy good. Also the bottom piece of white thing is EDIBLE! From now till the 18th, find these cookies at The Brooklyn Flea.